Handbrake is good for Bluray ripping, but as for DVDs, WinX DVD Ripper is accepted and recommended by more users and authoritative websites. At beginning of 2011, one of the biggest surprise brought by Handbrake was Blu-ray support. So after Handbrake 0.9.5, it seems that ripping Blu-ray to computer hard drive becomes as handy as a pocket in a shirt. In fact, however, it is not a 1-2-3 routine to rip Bluray with Handbrake while preserving the best output image/sound quality and keeping ideal file size compression instead of original 50GB. Read this tutorial about the Best Handbrake Bluray Rip Settings that will hopefully give you some help. Note: Before learning this Handbrake Blu-ray ripping guide, make sure you have decent understanding of HandBrake Video Setting Control Panel from our Handbrake Video Quality Settings page. An ordinary Bluray disc is 25GB or 50GB. It is not convenient not even yet possible to copy all the Blu-ray content to computer hard disc. So shrink Bluray content to smaller size is reasonable when you want to create Bluray collection on computer rather than BD shelf. If do not count in Bluray supplements like menu, chapter points, Director Commentary, etc, the main movie may be around 30GB. But it is still too large to our Hard disk storage. 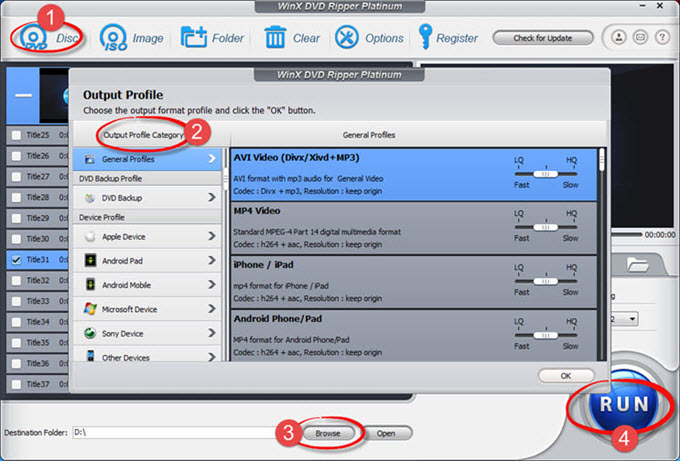 Ideally, it is possible to rip 30GB Blu-ray to 8-5GB MKV file while still keeps HD visual quality. Here are tips about how to preset when using Handbrake rip Bluray. 1. MKV container, H.264 Video Codec, High Profile preset, disable detelecine and decomb unless you need them. Drop the width to 1280 (while the length will automatically drop to 720). Drop the quality setting to RF (Contant Quality): 25. 2. Raise the rate factor until you can't stand it anymore. You still won't hit 5G for a feature length film. 3. And use the nightly, since it supports the BR disk structure. A lot of movies are split across multiple M2TS. 4. No matter what, just keep only one audio/subtitle track. 5. Pirates are rarely as space efficient as you're targeting. They normally take 1GB just for a 42 minute 720p TV episode. 6. And make your x264 advanced options string bframes=8:b-adapt=2:direct=auto:me=umh:merange=24:partitions=all:rc-lookahead=60:ref=16:subme=10:trellis=2. How to HandBrake Rip Blu-ray with Subtitles? 1. Insert a Blu-ray movie disc into your Blu-ray drive. 2. After HandBrake scans it, click "Subtitles" tab. 3. Add subtitles: Select a language, tick "Burned In" checkbox to lock the subtitles to the movie; alternatively, select Closed Captions from the drop-down list to get the subtitles in the original language of the film. 4. Click "Start" and you can get the Blu-ray movie ripped with subtitles using HandBrake. If you can not bear the complexity of install third-party software to assist Handbrake rip DVDs, or you just need faster and more convinient DVD ripping solution, here is an alternative for Handbrake - WinX DVD Ripper Platinum. This DVD ripper is always frequently updated to rip and backup almost all protected movie discs perfectly, then to iPhone (up to iPhone X), iPad (iPad Air, iPad Pro, iPad mini), Apple TV, game consoles (PS4, Xbox One), as well as Android and Windows tablets and smartphones. Meanwhile, it still gives breakthrough performance to convert Hollywood like Disney DVD movies, Warner Bros DVD movies. Fix Handbrake Distorted Video - Handy tips and tricks for fixing Handbrake distorted video when ripping DVD on Windows 10/8/7. Can't Rip DVD with Handbrake? [Solved Now!] - Detailed guide on how to solve 'Can't rip DVD with Handbrake' problem on Windows 10/8/7, etc. Cannot Attach Subtitles To A Movie with Handbrake - Learn how to solve - When riping DVD to a file, and enable the subtitle option, but cannot find the subtitle on your output movie. HandBrake Not Working - Learn how to fix HandBrake not working errors, like 'HandBrake crash', 'HandBrake won't rip DVD' to get a smooth DVD conversion. Handbrake Error Message: "No Titles Found" - Learn how to solve - when i click on the source of the dvd i get an error saying "no titles found. please make sure you have selected a valid non copy protected source". Some of DVDs Handbrake Only Rip Half Way - Learn how to solve - Some of my dvds only rip half way. Does anyone know what my problem might be. HandBrake "Error Opening" When Finished - Learn how to solve - sometimes, handbrake never seems to finish compressing a dvd. it just stays at 100%, eta 000000. HandBrake Crashes Before Finishing - Learn how to solve - Before HandBrake finishes a rip of a relatively long title, like say 20+ minutes, it crashes right as it gets at the finish, and as a result the rip is corrupted. HandBrake Convert AVI to MP4 Problem - Learn how to solve - trying to convert some avi files into mp4 files using handbrake, selected the apple presets, the process starts then after a minute or so it crashes. Need better suggestion of using Handbrake to rip Bluray, please Email to Digiarty Support Team.